Natural Transformation – Smaller size transformers are immersed in a tank containing transformer oil. The oil surrounding the core and windings gets heated, expands and moves upwards. It then flows downwards by the inside of tank walls which cause it to cool and oil goes down to the bottom of the tank from where it rises once again completing the circulation cycle. The heat is removed from the walls of the tank by radiation but mostly by air convection. Natural transformer oil has large coefficient of circulation is quite effective as the expansion. 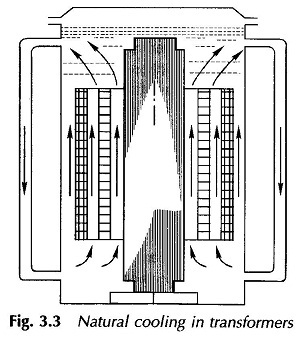 Still for large sizes, because of the arguments presented earlier, the cooling area of the tank must be increased by providing cooling fins or tubes (circular or elliptical) as shown in Fig. 3.3. This arrangement is used for 1 all medium size transformers.